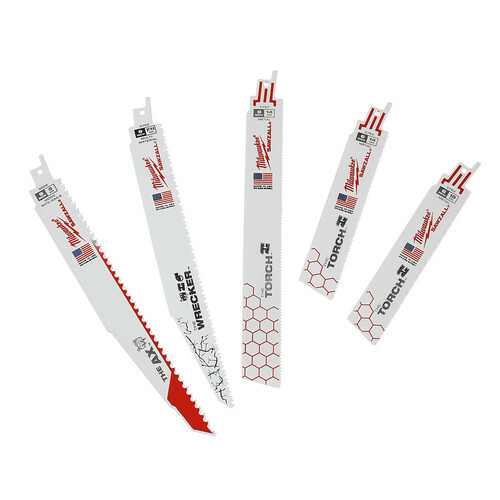 Milwaukee's 5-Piece Demolition SAWZALL Blade Set features an assortment of their most popular demolition blades designed for a broad range of applications. Constructed to be thicker for maximum durability, this set features both "The Ax" and "The Torch" SAWZALL blades for cutting both wood and metal with precision and ease. The company that sells this product is top notch, very good ordering policy,excellent shipping methods! Nice assortment to have on hand, the case is also convenient. I got this set free when I bought another set of blades. Can't beat that. I won't be buying blades for quite a while. I have cut wood, pvc and metal pipe with these and they cut great and don't burn up to fast. Will these blades work in the M18 Fuel hacksaw ? BEST ANSWER: They should fit in the M18 battery reciprocating saw. There's a small button that pulls back easily to fit the blade into the tool. And the saw and blade work great! Yes, the will fit the M18 hacksaw.